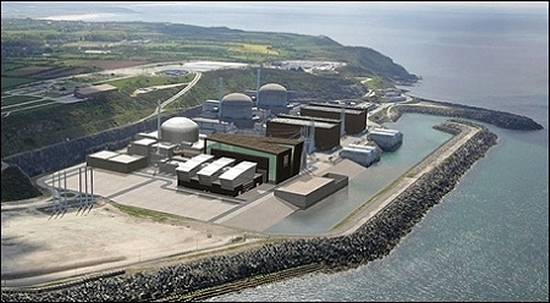 In last October, the Government of the United Kingdom (UK) gave the go-ahead for a new nuclear plant. This will be the first nuclear power station to be be constructed in the UK for numerous decades. The agreement regarding this nuclear plant shows well how competitive Icelandic electricity is, and makes it clear that an electric cable between Iceland and the UK could be very positive for both countries. The above mentioned agreement on the nuclear energy involves an enlargement of the Hinkley Point Nuclear Plant in Somerset (Hinkley Point C). The new reactors are scheduled to be completed ten years from now (2023). The plant will be built and operated by the French energy firm EDF (Électricité de France) in cooperation with Chinese investors. EDF has negotiated a guaranteed fixed price – a strike price – for the nuclear electricity at 92.50 GBP/MWh (equivalent to approximately 150 USD/MWh). This strike price is in 2012 prices. The price will be adjusted according to inflation during the construction period and over a subsequent period of 35 years. According to the BBC, the existing nuclear plant at Hinkley produces about 1 per cent of the UK’s total electricity. This is expected to rise to 7 per cent once the construction of Hinkley Point C will be completed in 2023. Strike Prices effectively remove price volatility risk for electricity generated from low-carbon sources. This ensures greater certainty to generators and minimizes their risk. The goal is to bring forward investment in affordable low-carbon electricity generation, including renewables and new nuclear. In total, renewable energy is expected to make up more than 30 per cent of the UK’s electricity mix in 2020, helping to significantly decarbonize the power sector by 2030. This means that the UK has very ambitious plans in expanding the production of renewable power. Earlier this year (2013), the British Government introduced the strike price which renewable energy technologies can expect in the coming years (2014-2019). The proposals are expected to become legislation in early 2014. According to a publication by the UK Department of Energy and Climate Change (DECC) the new regime will make the UK market one of the most attractive for developers of most renewables technologies, whilst minimising the costs to consumers. The proposed renewable electricity technologies eligible for the strike prices for example include hydro, geothermal, onshore and offshore wind, tidal and solar projects. The strike price for geothermal power will be 120-125 GBP/MWh (approximately 190-200 USD/MWh) and strike price for hydro will be 95 GBP/MWh (approximately 150 USD/MWh). The lowest strike price is for sewage gas; 85 GBP/MWh (close to 135 USD/MWh). However, what is probably most important and interesting is the strike price for wind power. The British Government expects the overwhelming majority of the new renewable-capacity will be new wind farms, both onshore and offshore. This is understandable, because the utilization of wind power for electricity production is a well known and mature technology. In fact the strike price for wind power can be said to be the base price for new renewable generation. And the strike price introduced for onshore and offshore wind is 95-100 GBP/MWh and 135-155 GBP/MWh, respectively. This is equivalent to approximately for 150-180 USD/MWh for onshore wind, and 215-250 USD/MWh for offshore wind. In comparison, Iceland could most likely offer the UK electricity from renewable sources at prices similar or even substantially lower than the strike price for new offshore- or even onshore wind capacity in the UK. And actually the Icelandic electricity can be seen as a better product and thus a better option than massive wind power in the UK. Both hydro- and geothermal power offer stable base load electricity, which is very different from the unstable wind power. With an electric cable between Britain and Iceland (IceLink), the Icelandic energy sector could provide the UK with stable and reliable power from the Icelandic hydro- and geothermal power plants, at very competitive prices. 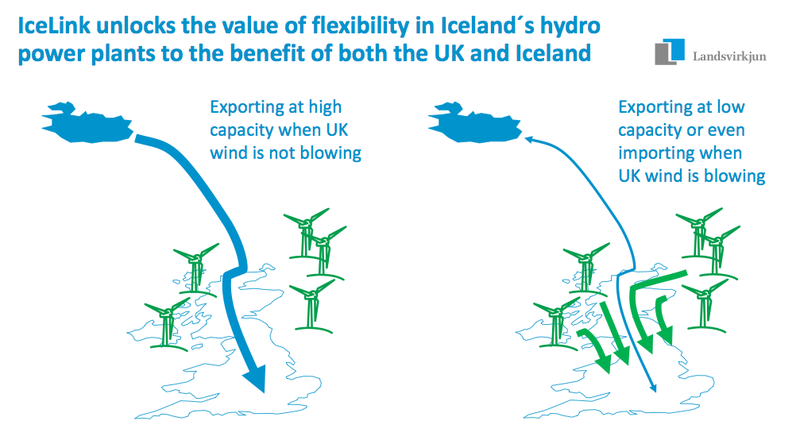 Iceland could also import some of the unstable wind power from the UK; especially during the night. This would give an option to “store” even more of the controllable hydro power in the dams in Iceland during the night. When demand in UK rises during the day this power can then be transferred through the cable to the electricity markets in UK. The UK wants to be able to move away from fossil fuels towards low-carbon power. What is even more important for the UK is to gain more energy independence and be able to rely on energy from politically stable neighbours (rather than for example importing more LNG from Algeria). Both the nuclear plant at Hinkley Point and plans for more renewable energy in the UK’s energy mix, are important in this context. In addition, a fifth of Britains’ aging power plants are due to close over the coming decade (with further closures in the 2020’s). Thus, the UK needs not only huge investment in energy production and -infrastructure, but also need to secure it self access to numerous reliable energy sources. Therefore the IceLink is a project that undoubtedly will interest the British energy sector and investors.